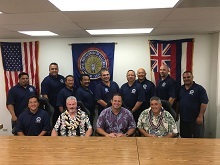 The 2019 IBEW 1357 Calendars are now available for Hawaii and IT&E members. Unit Meetings are a chance for members to receive the latest information in Union affairs. Click here to view the Unit Meetings Schedule. Business Manager-Financial Secretary Troy Benevides discusses the current state of Union business. To read this month's Business Manager's Report, click here. Union dues are based on members' straight-time hourly rate of pay (Article IX of Local Union 1357 Bylaws). Whenever a member's hourly rate of pay increases, his/her dues assessment increases accordingly. The 1% HT general wage increase takes effect December 23, 2018. Dues adjustments become effective on the first pay period following the adjustment.